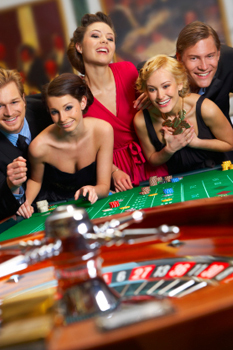 Some past Upstate Vegas Events customers have shared their casino party experiences with us. If you would like to share your casino night with us, please contact us. Wow - Everyone LOVED the casino night! People said it's the best holiday party they have even been to! So thank you! Thank you for all the energy you put into helping us have a successful event last Wednesday... Your dealers ... engaged the people, taught us how to have fun, shared with us a few tips or the trade, and encouraged all of us to spend someone else's money. We would recommend you and be happy to work with you again! Thank You! I just wanted to say thank you one more time for the terrific hospitality and professionalism you showed my family on December 28th. My parents couldn’t have had a better night. I just wanted to thank you and your staff for doing such an amazing job at our CASA-blanca event on Friday... Everyone kept commenting on how much fun they had and how they can't wait to come to the event next year! Our board has already said to go ahead and book the date with you for next year and I am just waiting to figure a date out with our special events committee. The dealers you have were absolutely fabulous and our guests loved them!!! Thank you for the very enjoyable "different & refreshing" evening on behalf of our fund raising efforts for the Realtor's Charitable Foundation! I just wanted to say Thank You for making our event a huge success yesterday. You and your staff did an awesome job and we will certainly recommend your services for future events. Your casino event ROCKED! Thank you so much! And your dealers were fantastic! Thank you for making our wedding reception so special, it was a huge hit! We would both be happy to be a reference for your business. Your entire group was fantastic! I wanted to tell you that we enjoyed ourselves so much. The employees were talking about it all day yesterday. I can't tell you what a great job you did presenting to us. The dealers were awesome!! They really helped while we were playing too. I will be more than happy to share our successful event with anyone who asks. Thanks for such a great job!! You really helped make our holiday event to be the best one yet! Have a great holiday season!! Thanks again. Upstate Vegas Events was definitely the talk of my wedding. Thank you so much for being apart of our memorable night. It was just a blast. Everyone is still talking about the party of the year!! One of the guys was telling my husband he won thousands of dollars!! I am sorry it started later for you but they planned some nice surprises for me and that made things run later. We will always keep you in mind for the future. I will let you know of any big slot wins. Everyone had a terrific time - even people who said that they "don't gamble". You and your dealers are terrific, very professional, and fun for such an event. We appreciate all your work - your prompt responses when we were working out the details to getting everything setup in a timely manner prior to the event. I would and will highly recommend you. Please feel free to use this with future clients. YOU ARE GREAT and we had a really fun holiday party. Thank you. I want to let you know how happy everyone was with our casino night on Saturday. Everyone has been coming up to me with positive words about how fun it was for all. The casino tables were so much fun, the dealers were amazing and very professional, and it truly made our first ever event a huge success. Can't thank you enough! You were also very easy to work with and so helpful with all of my questions.... Thanks!!! I’ll be in touch within the next few weeks to select a date for next year! I wanted to say thank you once again for making Saturday night so much fun. Everyone raved about your team and how much fun everyone of you made the night. I feel so lucky we found your organization 4 years ago. You are all so professional and at the same time, fun to work with. What an amazing combination. If you ever need someone as a reference don't hesitate to send them my way. ...We are a small organization but doing what we can to make a difference and you and your team play a big role in that. For that I thank you. Please extend my thanks to everyone on you team. Thank you for a wonderful evening. I've had several people coming over to my desk to say how much fun they had. I will definitely recommend you for any upcoming events. Thanks again for making my event a success! Just wanted to follow up and let you know that your crew was a hit on Tuesday evening. The time went by way too fast for me and I learned a good deal about black jack. Great reviews from the party! My people had a great time. They loved your service. Thanks again. We wanted to say thank you for hosting a wonderful event. The casino night was a huge success and we have received many compliments. We really appreciate your flexibility and down to the minute details. Your dealers were excellent and our guests really enjoyed them. Thank you for such a fun event! I am writing on behalf of our entire staff to thank you and your staff for providing the exceptional and exciting entertainment for our Holiday Party. This year we wanted to try something new and different for the entertainment and were just what we were looking for! The quality of the dealers you provided was exceptional and just like being in a real casino. The best way that I, as a manager, can show my appreciation to the staff is to provide them with a great holiday party. With your help, I was able to do that. Thank you and I am looking forward to working with you at our annual summer party! I want to thank both of you for a great evening! Friday night at Eagle Vale was the most successful Chamber event in a long time. At home later that night my son Robin said to me, "Dad, if I knew how much fun tonight was going to be I would have invited all my poker buddies, they would have had a blast!" I believe his statement sums it up for all of us on the board that attended that night. We didn't know what to expect. Wow, what a surprise!! My only complaint is that the evening was over much too quickly. I would have played Blackjack until midnight! With the feedback I received that night I believe we will easily double the attendance next year. Perhaps next season we can put on a Casino night in late Nov. or early Dec. as a foundation for our Christmas party. Again thank you! On behalf of the RIT Student Athlete Advisory Committee, we would all like to extend our deepest thanks for all your help in making our annual athletic formal a HUGE success. All the athletes had a wonderful time and your games (tables) really topped off the nights and added excitement to the event.....By the end of the formal we were able to raise about $3400 which will be donated to the American Red Cross in Rochester. Thanks you so much! Thank you again for the wonderful service that Upstate Vegas Events provided to the Gananda Sports Boosters at our November 7th event! As always, your staff was professional and fun to work with; our attendees had a great time! I just wanted to take a moment to thank you for a fabulous event on Saturday night. I have received many favorable comments over the last couple of days. My guests were so impressed with the Dealers at the event. They delivered with professionalism and enthusiasm. They helped me fine tune a couple of things that evening to ensure a memorable experience was had by all! Thank you again for a quality event. Everyone had a great time! Thank you for all your effort. Your dealers and equipment were all nice and professional. It really added to the overall event! Thank you for a VERY successful Monte Carlo night! Please feel free to use this as a testimonial. Your whole group was amazing. It was professionally set up, worry free and everyone had a great time. Your dealers were very helpful in teaching people the games and everyone was raving about your services. Thank you so much! Thank you so much for your donation...and for the Rochester's Casino Night Fundraiser... It was a great first-time event, raising more than $63,000! It was a blast! Having Upstate for our Christmas party was better than we could have expected. Our clients and employees had a chance to interact in a very informal way. Next year we are going to double the size of the party. Your gaming tables are great and you and Paul do a wonderful job-you are both very professional, but also friendly with these teenagers. Thanks for making Rob's 18th birthday party a success! I look forward to working with you again. I am so glad I got to meet you and thank you again for making our baby reveal/baby shower/beer & diaper event such a very special evening. As I have been told many times over, everyone had such a great time playing at the tables and I was so happy to hear that. Truly I am so looking forward to doing a casino night again. Thank you so much for helping to make our staff Christmas party a success! Everyone had a ball and enjoyed the casino games! Thank you very much... We were more than pleased by the professionalism and expertise of you and your staff. This was our ninth annual fundraising dinner and our second casino night. We received compliments on the gaming and the helpfulness of the various dealers. One person who has attended all our events told us this was by far the best! The event was well-attended and more than $8,000 was raised! We look forward to holding our tenth annual fundraising dinner... and would like to once again, include Upstate Vegas. Cannot thank you enough for yesterday. The TEAM appreciated everything you did. Today, everyone was talking about how much fun they had and asked if we would do this again. Thank you for the training and tips. I look forward to working with you again in the future. Thanks. I wanted to thank you for the great job you and your staff did yesterday for our event. Everyone had a great time! I will definitely keep you in mind for future events. Thanks again! On behalf of all of the HR Works’ employees we’d like to say THANK YOU SO MUCH for such a great event. People are still talking about it. I really appreciated that everything you promised in terms of the set up, the timing, the chips happened on schedule. The dealers were great. I really appreciated the instructions re: how the raffle would work also. All in all it was such a success. I would be happy to be a reference for your organization any time. Your staff was fantastic as usual. Thank you so much for a wonderful evening!!!! Happy Holidays to you and the staff! Thanks again for such a great night! I know that Josef had a wonderful time. Your team made it feel just like Las Vegas!! Please, let your team know how appreciative we are of their time and talents! I just wanted to extend a huge Thank you to your company and the dealers that were here this weekend!!! We were more than pleased with the event!!!! We will be setting up an event next year so I definitely will be in touch!!! !